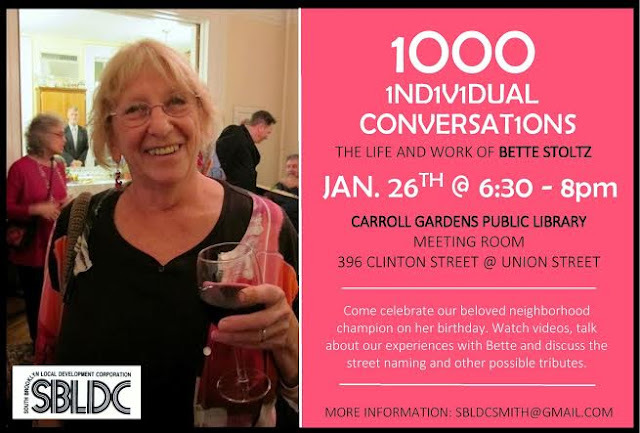 Please join family and friends of activist and neighborhood champion Bette Stoltz on January 26th, which would have been her 75th birthday. The film "A 1000 Individual Conversations: The Life And Work Of Bette Stoltz", made by Erica Stoltz, Sabine Aronowsky and Steve De Seve about this extraordinary woman, will be screened for the occasion. Bette, who passed away this past November, was behind the revitalization of Smith Street in the 1990s. 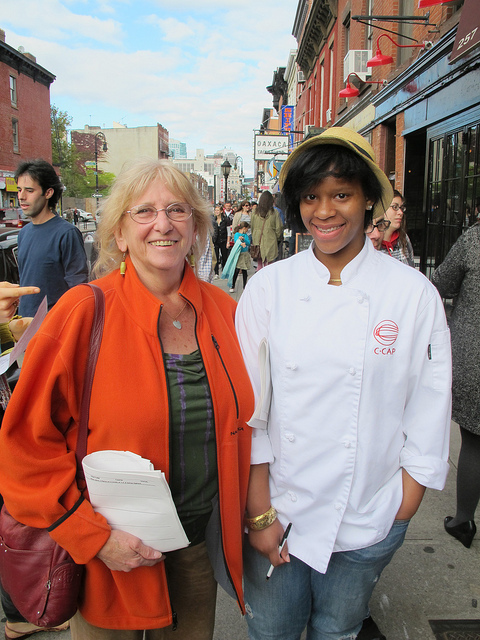 Through her non-for-profit organization South Brooklyn Local Development Corporation (SBLDC) she organized the much loved Smith Street Soup Festival in the fall and Smith Street Funfair in the summer. She helped put together the the incredibly popular Bastille Day Pétanque Tournament. She also made sure that Smith Street was decorated for the Holidays in December. In addition, she served for years as a member of Community Board 6, was involved in the creation of the beautiful Transit Garden at the corner of Smith Street and Second Place, represented her organization on the EPA Gowanus Canal Superfund Community Advisory Board and was a member of several neighborhood associations, including Friends And Residents of Greater Gowanus. Th January 26 get-together will give the community an opportunity to begin the conversation about how best to honor and remember Bette. Perhaps, together, we can carry on some of her work. To read more on Bette and her achievements here.